Give people the tools to express what they see, and you never know what they’ll show you. That is the idea behind the Lens of Empowerment project, a three-course program undertaken by 11 UFV students that examines the lives and experiences of women in Stó:lō territory. Part of the inspiration for this project came from a desire to acknowledge Stó:lō territory for future generations. And the video and still images depicting the experience of women in Stó:lō territory will be presented in an international context this summer. The exhibit will be presented at a conference in Loughborough, UK, in July. Universities from England, South Africa, and Palestine are also participating. UFV visual arts instructor Sarah Ciurysek will be an artist-in-residence at the same event. The 10 women and one man enrolled in the Lens of Empowerment project each took Visual Arts 180 (Digital Photography) with Ciurysek and Visual Arts 160 (Video Production) with Stephanie Gould in the fall. During the winter semester, they worked on bringing the exhibition together in the VA 390 (Community Arts Practice) course, team-taught by Ciurysek and Gould. Some of the students had previous photo or video experience or were already enrolled at UFV; others came to the university specifically to take the program and had no or little visual arts experience. Some are Stó:lō or from another aboriginal community; others are not. The photos and videos that have resulted from the project include biographical pieces about local women. Gould says the intensive seven-month experience has been “extraordinary” for all involved. “There was a very steep learning curve for all the students when it came to photography and video,” noted Ciurysek. 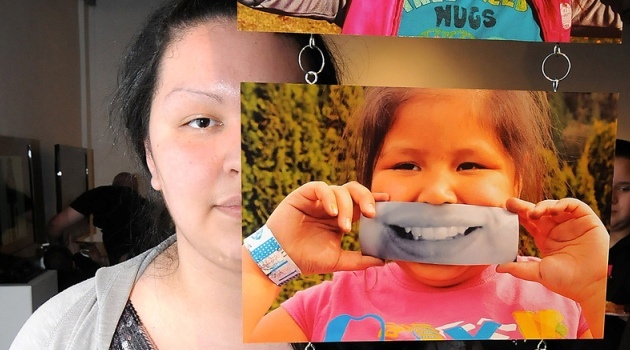 Andrea Smith’s striking photo exhibit juxtaposed two types of portraits of aboriginal people holding their status cards. In the first set you see, the faces of the people are blurred and the status card stands out in stark relief. In the second set, handing behind the first set and obscured by it, the faces of her subjects are in focus and the status cards are blurred. Smith is working towards her Bachelor of Fine Arts degree at UFV. Trina Hunt is a young Stó:lō woman who spends her summers immersed in the powwow dancing circuit and other parts of the year preparing for it. She is learning, and helping to keep alive, the tradition of making dresses for powwow dancing. Her still photography project used photos taken during the summer circuit, and her video depicted herself in the process of making a dress in her bedroom. The careful attention paid to the steps of dressmaking in the documentary video will help preserve these methods, as well as giving the outside world a look into her creative process. “This was a great opportunity to look at our traditions through photography and video,” she said. Jennifer Janik used the project as an opportunity to explore the dual sides of her heritage. She is a member of a large Stó:lō extended family, but is also Polish on her late father’s side. In her video she portrays herself as immersed daily in Stó:lō culture and family life, but somewhat removed from and curious about her European roots. In her photography exhibit, she examines the values passed on by earlier generations of Stó:lō by posing a young Stó:lō girl holding black and white photos of eyes, a mouth, hands, and feet in front of her. Janik is just starting her university studies and taking some Halq’eméylem language courses. She enjoyed the Lens of Empowerment program for the opportunity it provided to get to know other members of the cohort from a variety of backgrounds and to learn more about their different backgrounds. Several of the videos produced by the student will stand as important documentaries about Stó:lō culture and practices, and women’s roles in Stó:lō society. Mandy Klepic’s video on Stó:lō woman and UFV Elder-in-Resident Charlotte Point features Point speaking on how Stó:lō was traditionally matriarchal, with women staying in their home village when they married, and maintaining and passing on knowledge and skills, and how that changed when western cultural practices replaced traditional ones. That, combined with the banning of the potlatch and other traditions, and the residential school experience, had a huge detrimental impact on aboriginal culture. Two of the videos featured Shirley Hardman, UFV’s senior advisor on indigenous affairs. One, by Laura Smith, invited the viewer into the experience of the sweat lodge. The other, by Michelle Auton, delved into her relationship with Terry Prest, a father figure in Hardman’s life who adopted her back into the Stó:lō community when she returned after being adopted out as an infant. Not all the project participants or subjects were Stó:lō. Imroze Deol is a young Indo-Canadian Sikh from Abbotsford who used the photo and video assignments to raise awareness about the issues faced by Indo-Canadian women in Stó:lō territory. The Fraser Valley audience got to see the work at the UFV gallery and other locations this past spring. A special opening and premiere of the Lens of Empowerment exhibition was shown in late March. The instructors, UFV Dean of Arts Jacqueline Nolte, and students Jennifer Janic, Jess Bennet, and Andrea Smith will be travelling to England to participate in an international conference in July. Other shows in Stó:lō territory are also planned.